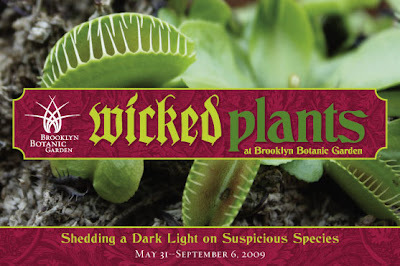 The Wicked Plants exhibit opened at the Brooklyn Botanical Gardens today. What a deliciously malicious theme! To kick things off, there was an author lecture and book signing by Amy Stewart, free tours, children's activities, an art opening featuring the hand-tinted botanical etchings of Briony Morrow-Cribbs and Discovery Carts laden with games and information. Amy Stewart is such an entertaining and informative speaker! She did a presentation on her new book, Wicked Plants: The Weed That Killed Lincoln's Mother & Other Botanical Atrocities. Everyone in the audience was rolling with laughter and at points, caught panic-stricken doing mental inventories of the plants in their gardens or households and evaluating what dangers they presented. During the book signing, Amy showed her box of botanical poisons. Artist, Briony Morrow-Cribbs was also present for the signing and for the exhibition of her prints. The image on the far right is one of her prints she did of rosary peas. Above is the YouTube trailer to Amy's new book. I think it captures the informative dark humor the book is written in. Even with the additions of "wicked plants" to the Brooklyn Botanical Gardens and all the extra emphasis on the existing sinister shrubs, poisonous prickles, and menacing members of the flora kingdom, it seems as though the bunnies are doing just fine. My friend Christina and her husband were in town on vacation and we agreed to take advantage of the nice weather by taking a stroll in Central Park. It was fun to play tour guide for the afternoon and show them some of my favorite destinations in the Park. Below are a sampling of images from our afternoon. One of my all-time favorite spots in Central Park is the Bethesda Terrace. I love how I almost feel transported when I walk down the elaborately carved stone staircases, through the tiled arcade, or around the angel-topped fountain. The other three places in the Park that top my list are Belvedere Castle, The Falconer statue, and the John Lennon "Imagine" memorial in Strawberry Fields. It was a pleasant afternoon! I remember having a dream that seemed so real, I felt that it must have happened. I couldn't have been more than 5 years old, because my sisters had already left for school and it was just my mother and me. I told her about the "bumpy" road, the people who said words I didn't understand, and pretty statues. Years later in my high school French class, we watched a short travel video on Paris and it seemed as though I was looking at my dream, playing out before me. The bumpy road was a cobblestone street, the words I didn't know were spoken in French, and the pretty statues... well... they were pretty statues. I've always carried a torch for France and all things French. When I opened the package from Lynn Davis of Expedition D, I felt like I was looking at travel souvenirs from France. I saw memories and experiences that were somehow transfered to polymer clay. It made me long for the City of Lights – a city I've never actually been, but have always dreamed of. 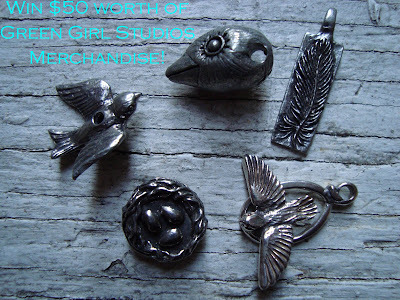 Check out her treasures listed on her Etsy Shop and her writings and photos on her blog. Art Bead Scene's The Bead Biz offers up a "less is more" philosophy to selling your work. Carmi's newest pendant is inspired by the forest floor. More spring cleaning tips to get your jewelry business in tip-top shape this season! 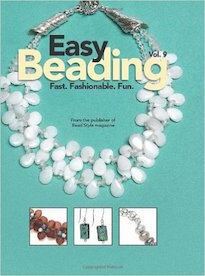 Easy Beading volume number 5 is out this month and is as great as always – check it out on Jean's blog! 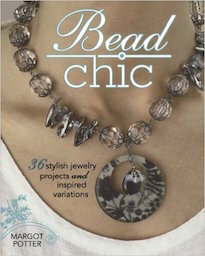 Bead & Button Magazine is talking about buttons and interesting ways to include buttons in jewelry desiging. Silver Threads Web Videos – Watch Jeanne Rhodes-Moen make some gorgeous filigree jewelry. 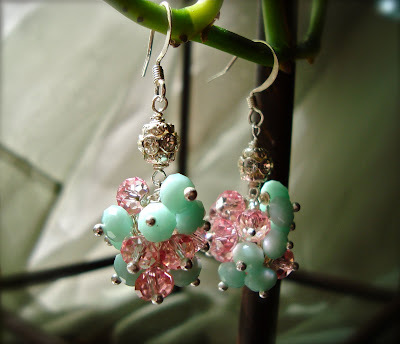 Andrew discovers the online jewelry supply store, Auntie's Beads, and was inspired to create a summery pair of earrings. I just received word that Stain Bar in my old neighborhood is closing this weekend. It wasn't just another hipster hangout, but a crossroads, a meeting place of the old and new. You'd never know who (or what) you'd run into sipping on a Stain Red or a Blueberry Port. Stain Bar, founded by a writer, Krista Madsen, was a haven for artists and writers of all levels, dreamers, and local beer and wine enthusiasts. I'll remember it fondly, as it's left an indelible stain on my memory. I've been experimenting with liquid polymer and making transfers. Above is a polymer clay piece I made. When I get back from Bead & Button, I'm totally going to experiment and play around with this product more! Remember! 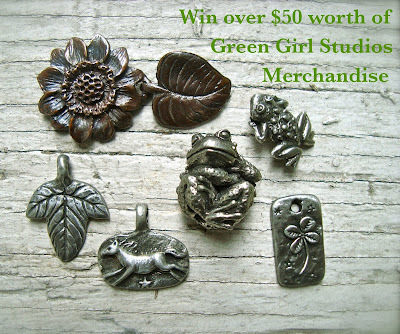 A NEW giveaway will be announced with every new 100 fans added to Enchanted Adornments by Cynthia Thornton. CLICK HERE to become a Facebook Fan. 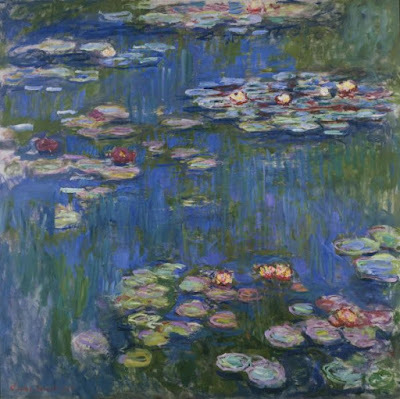 The Art Beads Scene monthly challenge for May is Monet's Water Lilies. A few weeks ago, I had the pleasure of going to the Museum of Modern Art on a quiet weekday morning. I made my way up to the Monet paintings. It was surprising just how empty it was. I'm used to going on the Target Free Fridays, when the museum is overrun by thousands of visitors. Usually folks are craning their necks to see, bickering over seats on the benches, or absentmindedly commenting on the beauty to anyone who will listen. I relished my unprecedented time alone in the gallery, all save for the silent security guard. I sat there in the nearly empty room soaking up the color, the light, and luminosity of his paintings... enjoying the quiet and looking at the paintings the way I think they were meant to be looked at. The above piece is my interpretation of the painting. 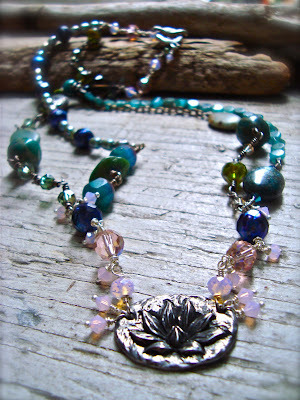 It's got a whole lot on it (Swarovski crystals, opalite, freshwater pearls, Czech glass, kyanite, jaspers), most importantly the fine pewter lotus charm from my family at Green Girl Studios. Here's the "beauty" shot. I like this picture the best, I think, because it really emphasizes the light and the way the colors in the materials seem to glow, kind of like the paintings. I was inspired by Candice Wakumoto's recent goodies from Japan and a dessert she described from her travels to experiment in the kitchen a little. I started out with a standard pudding recipe and blended in some matcha green tea powder before the mixture thickened. The texture was velvety, the flavoring subtle, and the color BRIGHT GREEN! My next experiment will be a matcha-flavored rice pudding. My piece, Nüwa and the Chinese Creation Myth, was selected as one of the finalists for the Beadwork Beaded Book Contest. 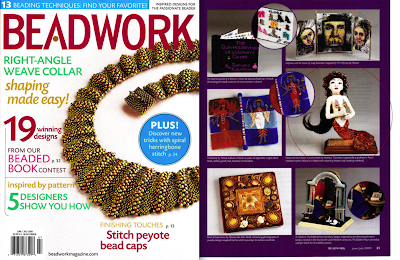 Check out the latest, June/July 2009 issue of Beadwork from Interweave Press to see more winners and check out a really great issue packed with projects and eye-candy! As luck would have it, Melissa J. Lee was in town. You might recognize Melissa from her many articles written for beading publications, her blog, or from her PMC and mixed media components. CLICK HERE to go to her Etsy shop. We met up in posh SoHo for coffee and a nice chat. I also got to meet the blog-famous Short One. I'm glad that we got to meet up and catch up in person! She's a gem! I'm not really a big musical fan, however, I do enjoy Joss Whedon's work (Buffy, Angel, Firefly, Dollhouse...) and found his Dr. Horrible's Sing-Along Blog very amusing and entertaining. It's on Hulu, so check it out! You'll laugh! Beads made from nuts are all the rage. Go nuts and add some to your bead stash! Want to try bead weaving but not sure where to start? Consider one of these amazing kits for 1 Bead Weaver. Melanie chooses a new name for her new work: Toolbox Treasures! 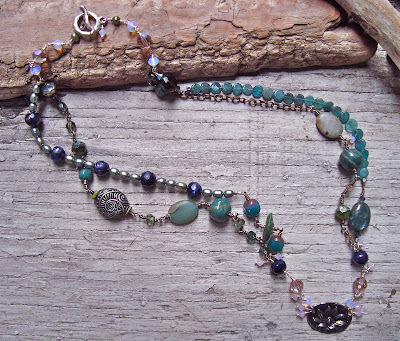 Repurpose old beads and charms into a wicked fun treasure necklace! Exposed Gets Exposure! 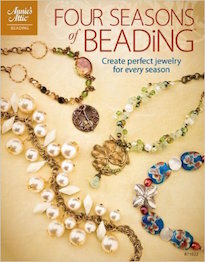 Learn more about Katie's latest beading book, Bead & Wire Jewelry Exposed. 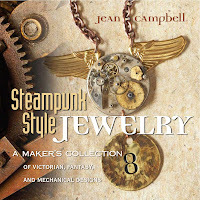 Jean reveals the cover of an upcoming wonderful new jewelry design book by Jean Campbell all about the fabulous Victorian-fantasy style of jewelry, Steampunk! Melissa shows off a new necklace design inspired by a beautiful, Russian hand-painted focal pendant. 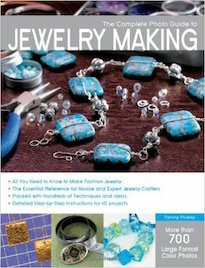 Andrew shares the NEW cover of his sister's new book, Enchanted Adornments: Creating Mixed Media Jewelry with Metal, Clay, Wire, Resin & More! Pre-order it today! One of my latest discoveries is the online beading store, Auntie's Beads. I'm completely charmed with their story and family involvement, and learned that the founder, Susie Henderson, grew up in the "Bootheel" of Missouri, where I spent many summers growing up and still have family to this day. To find out more about Susie and the rest of the Auntie's Beads team, CLICK HERE. I decided to give them a whirl and wasn't disappointed. I loved how dedicated they were to customer service and were willing to answer any question I threw at them. I created the above earrings from materials found on Auntie's Beads and headpins that I made myself. I think they are fun, funky, full of movement and light, and perfect for summer fun! 2. Cut 2 sterling silver 0.5" lengths of cable chain (3 links each). Using 1.5" silver wire, create a simple wire-wrapped loop, attaching it to the end of one length of chain. String 1 Swarovski ball, and create another simple wire-wrapped loop, attaching to the French Earwire, effectively creating a wire-wrapped link. Repeat for second earring. 3. Each link of chain will have six wire-wrapped Swarovski rondelle dangles, three on each side. On the first side the pattern will be: 1 mint alabaster rondelle, 1 light rose rondelle, 1 mint alabaster rondelle. For the other side, the pattern will be: 1 light rose rondelle, 1 mint alabaster rondelle, 1 light rose rondelle. Repeat twice for the remaining two links. Repeat entire step for the second earring. Customize: To make these earrings more seasonally appropriate for other times of year, switch up the color palette and patina the wire with liver of sulfur to give your wirework more detail, depth, and interest. 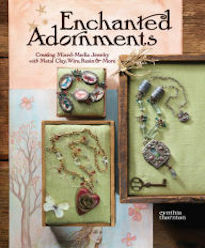 Promoting Cynthia's new book, Enchanted Adornments: Creating Mixed Media Jewelry with Metal, Clay, Wire, Resin & More. I can't sleep and when I do, I dream up new ideas to get the word out. I prefer to drink out of white cups or glasses. If possible, I only like to drink out of the same white cup. I'll occasionally rinse it out, but I won't wash it until someone else washes it and then I repeat the process. Boxers and sometimes pajama bottoms. If I don't have to leave the house I'll stay in my sleepware all day. I like to be comfortable above all else. Slow-cooked beef and pasta. I started it this morning, but I cheated and used a store-bought sauce instead of making my own. A bag of flour from my local bodega. Green Tea or Caramelized Pear with Toasted Pecans. Sarkilahti is a very talented artist and jewelry maker, who takes beautiful pictures and seems really happy. Near the beach, with a garden, close to the mountains, in or near a small town but close to a big city. I'd like to really learn Latin and not for pretend or to pass a test in school either, but REALLY know Latin. The rising tide raises all boats. I like a lot of different colors. Different shades of green, crimson reds, and rich blacks. My black hoodie with a striped lining. To make things and not have to worry about bills. Stringing Magazine (or any of the Interweave bead magazines) and Selvedge. I also like Everyday Food. I don't really know how much money that is. If it could be on any, probably a couple of Anne Choi beads. Uhmmm, I have a lot of different favorite designers. One of my favorite jewelry designers is Nina Bagley. Tilda Swinton. She's an avant garde fashion icon who could wear anything and make it look couture. At home, comfort rules. In public, anything that'll make me look good, but not outrageous. Write project instructions and continue to send out emails. Maybe design some jewelry and finish some collages if I'm lucky. Amelie, Requiem for a Dream, Practical Magic, Girl with a Pearl Earring, Pan's Labyrinth, and Aliens. Seeing things and looking at the world around me, other artists, good books, songs that make you want to cry, prayer, and long walks. What's your favorite work of art? Fireflies on the Water by Yayoi Kusama. Take the virtual tour if you haven't seen it in person! 1. Respond and rework; answer the question on your blog, replace one question that you dislike with a question of your own invention. 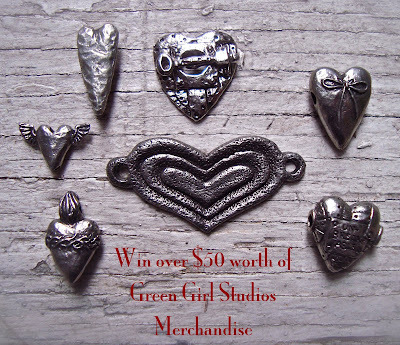 One lucky Facebook Fan of Enchanted Adornments by Cynthia Thornton will be selected to win $50 (retail value) of FREE Green Girl Studios merchandise (4 fine pewter components and 1 sterling silver bird toggle). 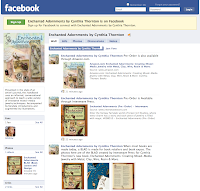 To enter, you MUST be a current fan of Enchanted Adornments by Cynthia Thornton on Facebook and leave a comment on the Giveaway Number 1 (AIR) photo in the Enchanted Adornments GIVEAWAYS album on Facebook. Fans will have 5 days from the posting of the photo and announcement of the giveaway to post a comment on the photo to be considered for the drawing. I've long been a fan of The Decemberists. I love a good story and lead singer and songwriter, Colin Meloy, knows just how to deliver that. That's why, when my friend Jenny told me about the new album, I was instantly intrigued. 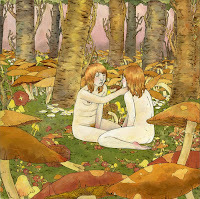 The new album, The Hazards of Love, is a concept album meant to be played from start to finish, chronicling the fairy tale relationship between Margaret and a dweller of a magical forest named William. This rock opera is told over the course of 17 tracks, deftly crafted with subtle allusions, stunning imagery, poignant poetry, and ominous foreshadowing. The Hazards of Love begs the listener to play the album over and over, revealing new layers and depths of meaning. Not only is this fantastical story rich with detail and skillful storytelling, but it is enhanced with captivating melodic instrumentals. Yes, I've found myself (the tone-deaf one) mindlessly humming along in public to the horror and dismay of those around me. 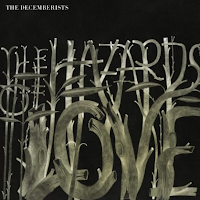 I definitely recommend The Hazards of Love by The Decemberists. 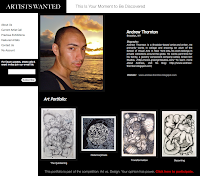 Artists Wanted is hosting a competition called, Art vs. Design. I have reservations about the title of the competition since I don't think that Art and Design are mutually exclusive and in fact enjoy it when they very clearly (or unclearly) overlap. 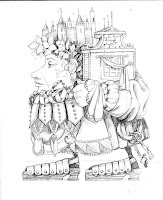 In any event, my portfolio of some of my drawings and collages is up. Check it out by CLICKING HERE. Also, if you've got time, participate in the competition! It's a lot of fun and you help determine the winner by your involvement and responding to "which one moves you more". 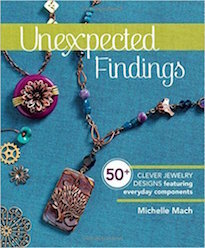 Are you excited about Cynthia's new book, Enchanted Adornments: Creating Mixed-Media Jewelry with Metal, Clay, Wire, Resin & More from Interweave Press? JOIN THE FACEBOOK FAN PAGE! Get all the latest information, interact with other EA enthusiasts, and participate in contests and giveaways! Opium Magazine has employed San Francisco-based conceptual artist, Jonathon Keats, to create the cover of their eighth issue in honor of "infinity". Apparently there is a nine word story that unfolds a century at a time, making it the longest story ever told. Each word is printed in a different ink that reacts with direct sunlight, slowly revealing the words over the course of 1,000 years! Speaking of how-to books... the lovely and talented Jean Campbell put together a fabulous collection of Steampunk-inspired jewelry projects from a group of designers working with "no fire" techniques. (I'm one of the designers!) The projects are supplemented with histories and overviews of the art movement. 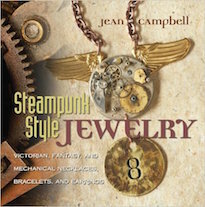 The book is called, Steampunk Style Jewelry: A Maker's Collection of Victorian, Fantasy, and Mechanical Designs and is available for pre-order on Amazon. 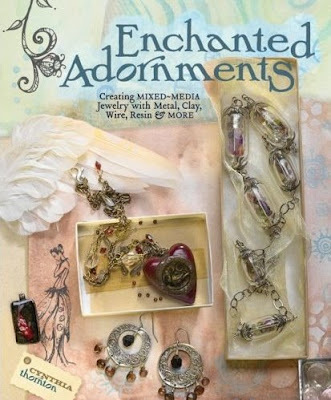 Here's the cover of Cynthia's new book, Enchanted Adornments: Creating Mixed-Media Jewelry with Metal, Clay, Wire, Resin & More! (I figure that since it's already on Amazon for pre-order and the cover appears there that it's okay to share it here.) I'm really proud of Cynthia and all her hard work! Make sure to pre-order your copy today! Don't forget to JOIN THE FACEBOOK FAN PAGE! I had the pleasure of chatting with Leslie Rogalski at Bead Fest Wire. While we were talking, I found out that she went to school to become an illustrator. Not only is she the editor of Step by Step Beads magazine, but she's also an artist! The image to the left is one of her drawings. CLICK HERE to see how Leslie incorporates her art with her love of beadwork in the newly launched Doodlebeads! When I was in art school, the word "beautiful" was a dirty word. It was kind of like calling something, "icing". It was even worse to call something "pretty" or "cute". That is unless it could be quantifiable, theorized, provoked the viewer, and/or have its plasticity "pushed" and "pulled". Perhaps that's why I never really fit into art school. I never felt at ease in an environment hungry for proverbial steak and potatoes, where calling something "ugly" was giving it high marks. Sure, I made good grades and I got all the concepts, working hard and diligently to absorb as much as possible. But at my very core, "beautiful" wasn't a dirty word. Since I've left art school, I've been in a slow process of deprogramming myself and really defining what looking at art and the world means to me. I've had to ask myself why "beautiful" was never a criticism, but one of the highest praises. Countless factors could go into what makes something "beautiful". One idea that I've rolled around in my head is that it has to break your heart a little. If there's a tiny pang of hurt or a flutter of feeling, then the work did its job – the work is beautiful. Anne Choi is by far one of my favorite beadmakers. Her pieces are little works of art that are imbued with a sense of poetry, grace, and bittersweet memories. This dancing stag beetle bead in sterling silver captures an Antonín Dvorák quote that reads, "Silver moon upon the deep dark sky this sleeping world you wander by." I first met Jennifer Sarkilahti in a Summer Residency program at the School of Visual Arts. At that time, Odette NY (her successful jewelry company) was only a glimmer in her eye. Swallowed up in the gestural nebulas she created with paint and tape, I remember getting completely lost in her ethereal paintings. College is one of my favorite mediums. The idea of taking two or more things of different origins and combining them into a cohesive hybrid is fascinating to me. I think that's why I'm drawn to the work of Nicole McConville. She pulls together forgotten and rusty things and transforms them into works of art that peel back the skin of nostalgia and digs around for visceral, golden moments lost in time. Her pieces seem to "remember". Often times whimsical and fantastical, Jen Tong's work finds a cornerstone in longing – whether longing to belong, to believe, or to have companionship, her work examines the space between. Using subtle dark humor, sensuality, and a high degree of sensitivity, she explores the realms of "the divide". 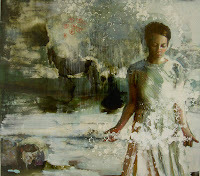 To look at Monica Cook's work is to quite literally know her. For years, she has worked with self-portraiture. She mixes tight technical skill with loose amorphous dreamscapes, to investigate what it means to be human, a vessel of histories and stories. Iviva Olenick, a Brooklyn-based artist, uses textiles and fabrics to tell stories. In her series, Were I So Besotted, she delves into the world of modern dating. Sometimes funny, sometimes melancholy, she captures a very relatable state of searching for connection. 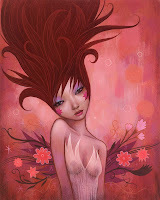 Japanese Pop Art has helped influence Chicago-based artist, Jeremiah Ketner of Small and Round, to create a dreamy, pastel world bounding with cute creatures and sensual nymphs. I've known Jeremiah for years and have taken great pleasure watching him use many layers of paint and pattern to explore this vibrant and happy imagined-landscape. Having a collage sensibility, Amy Wilson's work weaves together vast quantities of text with her drawings and watercolors. She pulls the words from fundamentalist political views, journal entries and art criticism, to help illustrate and expound upon her "industrious little girls". She uses the little girls, as a symbol for herself, to explore the outside world with the internal. Using mixed media, Nina Bagley creates narrative jewelry. Her pieces made of fabric, semi-precious stones, silver chain, and found objects are the result of bridging the ephemeral and fleeting with a concrete present. Nina masterfully crafts work that functions as touchstones that embody the act of cherishing every moment – capturing stories in the wind and words from the heart. Each piece is a poem. I collect postcards for my studio wall for inspiration. If I was fabulously rich, I would collect originals, but alas, the next best thing are prints and postcards. The latest addition to my collection comes all the way from Finland, via the artist Reetta Isotupa-Siltanen. I first found out about Reetta on Ullabenulla's blog HERE. Isn't her work charming? 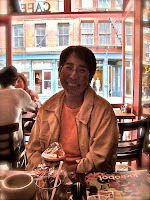 CLICK HERE to visit her Etsy site and HERE to learn more about her and get a glimpse into her life. My good friend, Candice Wakumoto made a recent trip to Japan. She sent me a goodie box filled with an assortment of treats from Japan and Hawaii. She sent everything from black toiletries, snacks, and special ice cream spoons, to reusable shopping bags and a fancy ear-picker. My favorite was the matcha green tea flavored Kit-Kat bars. They were delicious! I also love the Cora Yee card as well! I'm going to put a goodie box together for Candice with things from New York and from my next trade show destination, Milwaukee. Not quite as exotic, but hopefully still lots of fun! On May 7th CopprClay was released to the public for pre-sales. (It won't actually ship out until May 22nd.) CopprClay and BronzClay were developed by Bill Struve and his family, who own and operate Metal Adventures in North Carolina. 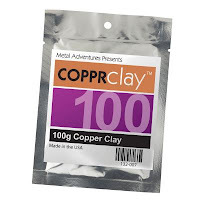 As the latest metal clay, CopprClay is just fabulous. Cynthia and I had an opportunity to work with it a few months ago and it's just divine. It's easy to use, has a silky texture, and has a longer working time. We were sworn to secrecy, so we haven't blogged about it, but have been doing tests when we could squeeze them in. (I'll ask Cynthia to post the pictures of the copper coins we stamped out.) I'm going to try and get ahead this weekend so that I can play around more with it later this week. I'm so excited about all the possibilities! Be inspired by Impressionism. Monet's Water-lilies are this month's challenge. 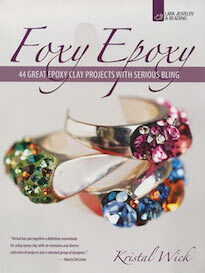 Take another look at this UK beading and jewelry magazine that has had a recent jewelry face lift. 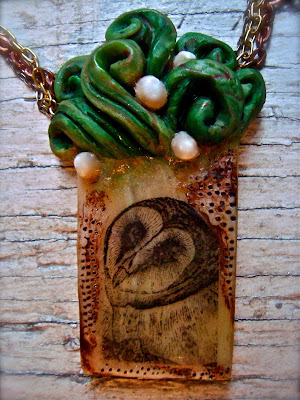 Bronze pendant inspires a nature-themed necklace. Carmi makes a cute summer necklace with cell phone dangles. Melanie shows some new works in progress, inspired by her family's workshop toolboxes. Spring cleaning tips to get your jewelry business in tip-top share this season! Melissa looks back on two years of making beads and designing jewelry. Taking advantage of the ten hour drive to Bead Fest Wire in Philadelphia, Andrew created three new necklace designs in the car! Here are a couple of new additions to my bead stash! I can't wait to use them. On the left are some of the masterfully crafted lampwork glass beads by Cindy Gimbrone. I love all the unique shapes and really organic vibe. 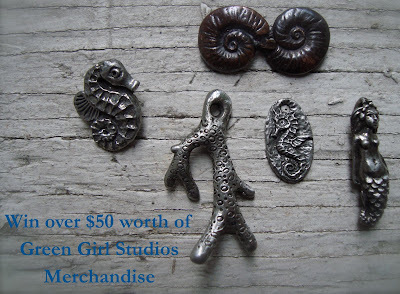 To the right are two ceramic "barnacle" or fossilized nautical pendants from LeAnn of Summer Stuido Pottery. Aren't they great? They've also got a really nice organic and natural feel to them.